Sri Lanka’s apparel export earnings grew 9.2 percent year-on-year (YoY) to US $ 451 million in September—the second highest growth rate recorded so far for this year backed by a double digit growth in exports to the US market. Joint Apparel Association Forum (JAAF) and Sri Lanka Apparel Exporters’ Association (SLAEA) remain optimistic that Sri Lanka will be able to achieve its US $ 5.5 billion apparel export target set for this year, helped by higher exports the US and the recovery in exports to the European Union (EU). During the first nine months of the year up to September, apparel exports grew by 5.04 percent YoY to $3.73 billion, with exports to the US market growing 5.84 percent YoY to US $ 1.66 billion and exports to the EU growing 4.43 percent YoY to US $ 3.57 billion. 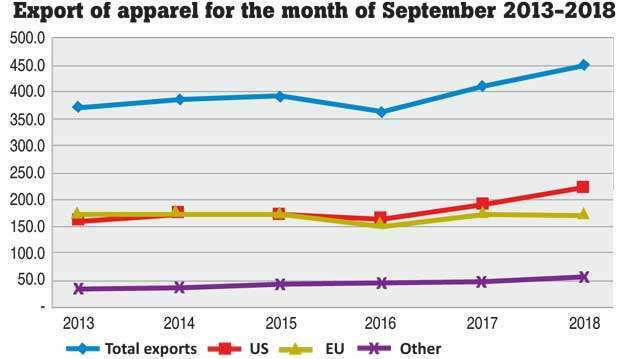 In September, apparel exports to the US grew by a significant 16.23 percent YoY to US $ 222 million while the exports to the EU declined by a marginal 0.57 percent YoY to US $173 million. The exports to other markets such as Canada, UAE, Japan etc. also witnessed a double digit growth of 16.67 percent YoY to reach US $56 million. Speaking to Mirror Business, JAAF Secretary General Tuli Cooray said that the negative growth recorded in the EU market is slowly getting adjusted, pointing out that in August, apparel exports to the EU declined by 7.81 percent YoY. He noted that as the winter season arrives late in Europe, it will be positive for Sri Lanka’s apparel exports. However, he expressed concerns on the current sluggish retail industry in Europe. Fernando stressed on the stable business and political environment and political stability, which is crucial for exporters, to reach export targets. Reasoning the apparel export growth to US in recent months, Cooray noted that Sri Lanka may be benefiting from the US-China trade war, as several front-end services have already shifted into Sri Lanka. “We really don’t know what the reasons for growth in exports to the US are. But we do believe that there’s an impact from the US-China trade war. There may be a slight trade shift, that’s a possibility. We do have a situation where front-end services are being brought into the country. We believe Sri Lanka is becoming more a knowledge-based service provider,” he said. Cooray emphasised that though existing apparel firms in the country would continue to operate and expand their manufacturing in Sri Lanka, there aren’t any incentives for foreign firms to shift their manufacturing plants to Sri Lanka, given the current labour shortage and relatively high cost of production. “Traditional manual manufacturing may not expand in this country as it’s not the competitive element that we have any longer. We will be definitely thriving in the front-end side,” he added. Cooray revealed that Sri Lankan firms are exploring the possibility of subcontracting, getting low-cost apparel from Bangladesh and other regional countries for value addition in Sri Lanka, given the current dynamics. “We do have logistics and knowledge for value additions, but our cost is higher,” he stressed. He noted that a “serious” industry delegation recently visited Bangladesh to explore this possibility as Bangladesh has the scale of production, while Sri Lanka has the knowledge and logistics for value additions and then to export to other countries. Fernando also expressed similar sentiments, stating that Sri Lanka could benefit by coming into an understating with Bangladeshi manufacturers to get low cost and volume-based production for value addition to be done in Sri Lanka. He noted that most of Bangladeshi firms, except for large players are forced to reject export orders received for value added products as they lack the “know-how”. “Bangladesh is also keen on working with us, because they probably hope to gain the knowledge, working with us in the long term as they lack the know-how to manufacture value added apparel products,” he said. Fernando emphasised that the proposed free trade agreement (FTA) with Bangladesh could benefit Sri Lanka’s apparel sector, which would encourage Sri Lankan and Bangladeshi manufactures to form partnerships, particularly SMEs. In addition, Cooray revealed that the industry are taking measures to address labour shortage by enhancing productivity, with technological upgrades and increasing the capabilities of existing labour to handle multi task components. “We are also exploring to take the industry to areas where labour is available. Sri Lanka is having various pockets where there are people. But that’s a very slow process,” he added.